How do you start your todays? My best days are ones I rise early, tiptoe into the kitchen and click, click, click on the gas stove to boil the kettle. I avoid that one noisy floorboard, close the door that leads to the sleeping small people and take my favourite mug from the drying rack. It’s lighter in my kitchen these summer days, even with the blinds still down, but I pull them up anyway, and push open a window for the fresh morning breeze. 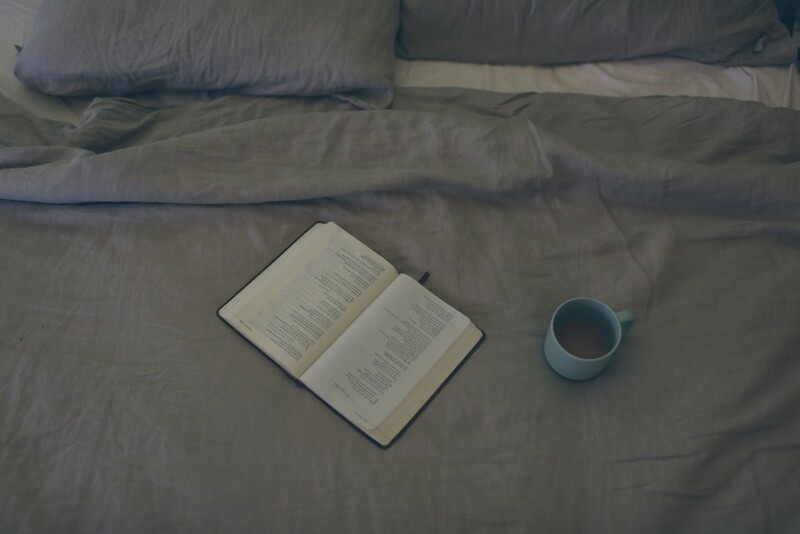 The tea is made, and my Bible opened and my soul quietened. The simple act of rising before the rest of the household sets a tone for my day, and a peace to my step. There is less rush, less impatience. It doesn’t make my day perfect, but I give myself the time to quiet my mind, and order my steps, instead of giving in powerlessly to the ebbs and flows of the day. It doesn’t happen every day. Some mornings I sleep too late and I’m bounced awake by a hungry and demanding child, and my feet must hit the ground running. But I love that every day is new. Full to the brim of possibility; new mercies, forgotten yesterdays, forgiven mistakes. Sometimes I live today before it’s begun, and spending too much thought on tomorrow. I run through lists of things I need to do, and instead of doing them, I let myself be distracted. I am notorious for anticipating with anxiety. It steals not only my joy but my attention from this moment right here, right now. As the New Year begun I quieted myself and asked what needed to change. What I want my tomorrow to look like must dictate what steps I need to make today. Today is not just today. It’s the beginning of all my tomorrows. Instead of dreading tomorrows, what am I going to do today? Today I have decided to live a less cluttered, more simplified life. It’s a big, never-ending job, that takes conscious daily action. So, today I buy nothing new to clutter my spaces. Today I dust shelves, and box unnecessary things and create openness in my space. Today I give things away, and elbow out the clutter. Each day it’s the little things. We step into a new today every morning, where those mercies are fresh and new and the promise is bright. If you weren’t happy with yesterday, there’s no better time than today to simply begin again. Em is wife to one, mama to three, and friend of many. She is currently studying a Bachelor of Arts in English and Journalism, and blogs at www.emhazeldean.com. With a natural ability to lace words together, her writing resonates the beautiful, delicate, raw and real elements of everyday life. She speaks light and hope, and writes from a reservoir of deeply anchored faith, trust and bottomless cups of tea. She believes hugs should be tight, coffee warm and mornings long. Amen! I too am starting this new year with a more simplified approach to my home and my spirit. In the end, it’s the people that matter and this “stuff” is getting in my way of loving the way Christ intended. Your words are refreshing…thank you!